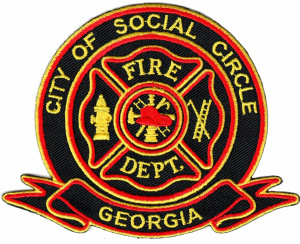 The City of Social Circle Fire Department is a growing and progressive combination of career and volunteer Fire and Emergency Medical Service professionals providing services to the City of Social Circle and the surrounding areas. Our coverage area is approximately 11.2 square miles of territory inside the city, which is located in Walton and Newton Counties just east of Atlanta, Georgia. We also provide services to parts of southern Walton County through an intergovernmental agreement. We are responsible for residential, commercial and industrial properties of all sizes and complexities and +/- 6000 souls on any given day. Our department has a current Insurance Services Organization (ISO) rating of Class 4, a number very important to your fire insurance premiums, indicating the level of service we are able to provide to you. Our staff includes one deputy chief, one administrative assistant, eleven full-time employees, five part-time employees, and ten volunteers. The members of the department stand ready to assist you in your moment of need. The staff is well trained and committed to providing the finest emergency services possible and understands the effect our role has in the community. We look forward to seeing you and welcome you to visit the department. Thank you for visiting our webpage and feel free to contact us if you have any questions.